Wow...just, wow! As always, I've slacked for a while and haven't posted, but this deserves a post. Today I had the opportunity to volunteer at the PDX Mini-Maker Faire @ OMSI and it was simply AWESOME! 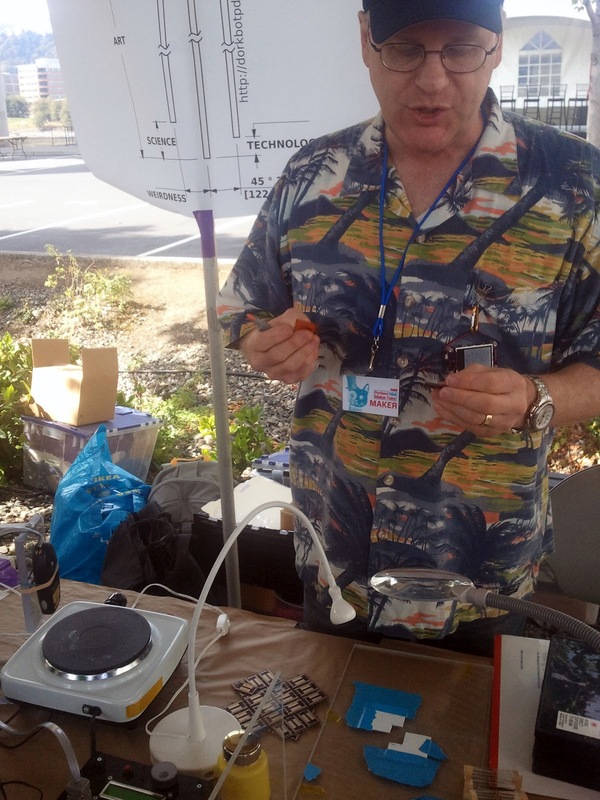 It was just the perfect event for me, and I encourage anyone who's a geek (or interested in applying to geek-dom) to definitely check out your local Faire. I've always said that I've wanted to do circuit board design as a hobby...yet I already have like 29,349,247 hobbies, so I've never had the time to do said hobby. After working at Intel and doing prototype board design for a living, I've definitely found my calling. I see myself becoming a consultant or working in a prototyping firm in Seattle or Portland (STILL working on that post :-P), doing design work for small companies and startups. I figure, hey, if I can't come up with an original idea or one that I'm not passionate about, why not help out other startups? Of course, it's a niche market, and though I'll try my darndest to get into it, there's always the chance that I won't get in the door. There's also the chance to work for Intel again (oh yea, I got an offer after grad school, yay! ), so we'll see. 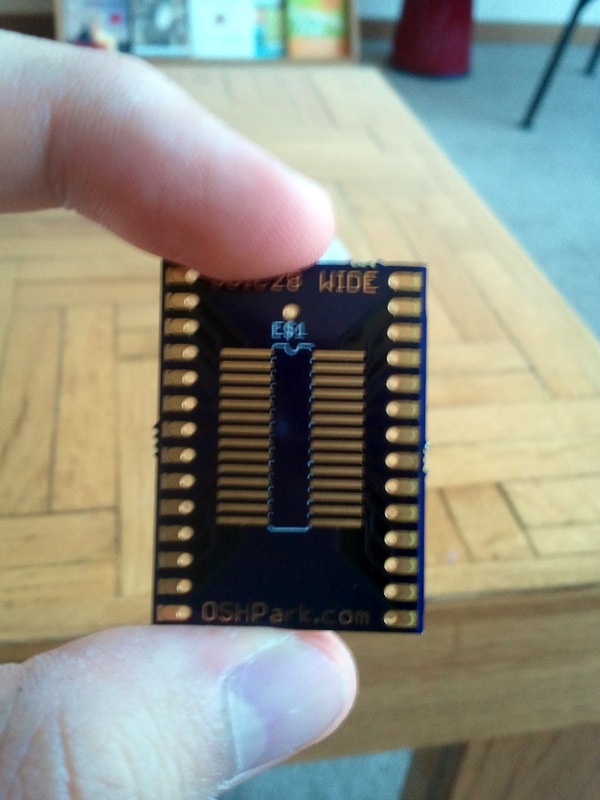 It's even possible that I start or work for a company not doing any sorta circuit board stuff. In that case, I've found my answer...Makers. 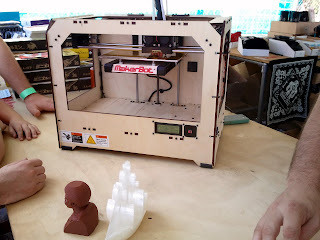 A maker is loosely defined as someone who is passionate about tinkering, finding how things work, going out and building it, and then sharing it openly with the world. It encompasses everything from circuit boards to model rockets to custom woodwork...name a hobby project you'd like to do, you're a Maker. The Faire is a great display of all the ingenuity that surrounds us, yet we may never see it. I agree with the founder of Make Magazine that we're an individualist group, everywhere and yet we never know each other except through the web. That's why these events are so great; we can come together and meet other, network and share awesome ideas and projects with each other and the community. SurplusGizmos.com, a store that's chock FULL of random electronics, motors, computers, you name it, they have it. I didn't even know these stores were around anymore. It's out by Intel, but I think I just may have to make a trip from Seattle a few times to grab some choice items. Swords anyone? 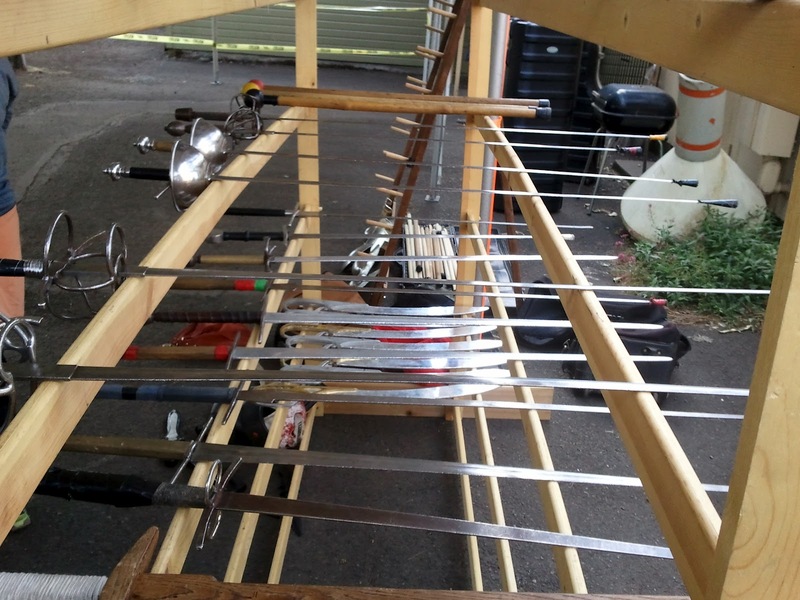 A variety of swords to test out and a working blacksmith are all available at the PDX Faire. A do-it-yourself demo on reflow soldering using a hotplate from Freddy's (Fred Meyer for the non-Portlanders)...something I definitely need to know for future projects. This also gave me a chance to talk with members of DorkBot, a electronics/maker enthusiast group all over the US, including PDX and Seattle! Learned about Oshpark.com, a great site for board builders to make small scale boards for their prototypes. Unlike big fabs, you can order small boards and small quanities for a great price (something like $5/sq in. ), which will be a life saver in the future of my projects. Made in the USA as well. Brain Silo, a place where you can rent workspace to geek out and use tools I don't have room for or can't afford...I wonder if there's one in Seattle? 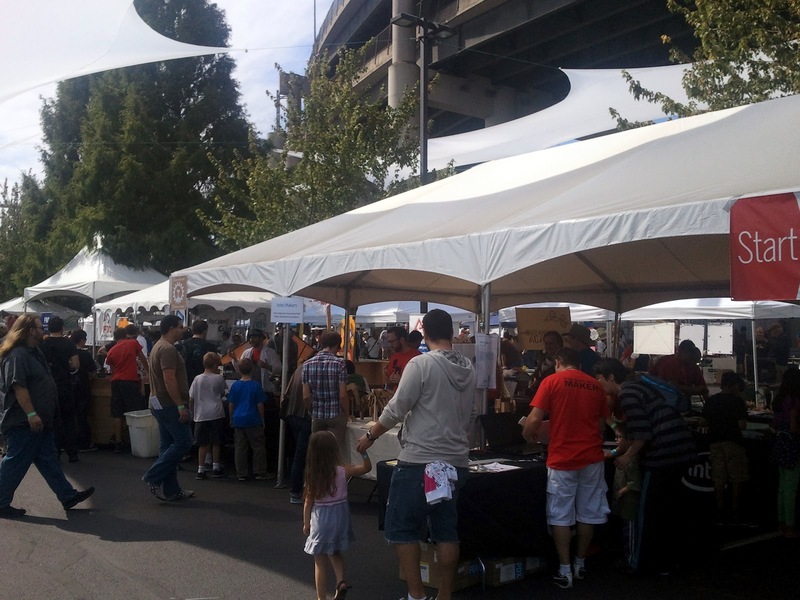 A stroll over to XOXO and the marketplace (open to the public) yielded Makey Makey, a awesome invention that uses human touch and electric current to take everyday objects and make them into human interactive interfaces. Imagine, a banana piano or a human-powered synthesizer...you gotta check this one out. And the list goes on and on and on...whew! 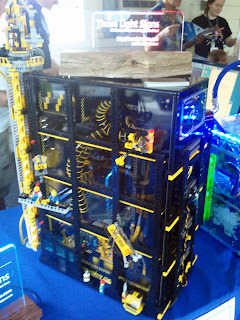 So there you have it, Maker Faire, check it out y'all! I'm sure I'll soon be looking at a lotta of these cool projects, not to say that I have the time haha, but we'll see. I've chosen to dedicate 1-2 hrs a day, even during school, to just "do": write, read, board building, blogging...basically a time to do all those hobbies I have. Well, back to PDX for a fun weekend and then off to Seattle for grad school next weekend. Stay tuned and have a great Saturday! Before I broach the subject of Seattle vs. Portland (a topic that I'm still researching :-) I thought I'd share my experiences on traveling between these two awesome cities in the PacNW. As I've written many times before on my blog, I try to avoid driving as much as possible. Do I hate driving? No, I love it, especially since I drive stick, but one person driving back and forth between Seattle and PDX isn't the best for the environment, not to mention expensive. So what do I do? Well, I'm sort of what you'd call a "transit junkie". I absolutely love riding on trains, buses, ferries and planes as much as the actual traveling itself. 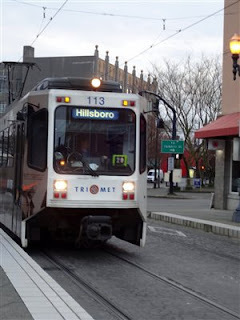 As one particularly loud and annoying passenger on MAX said last Friday, "most of the fun of traveling is getting there" and I couldn't agree more. Maybe you don't agree with me, maybe you think mass transit is too slow, dirty and doesn't get you where a car does, and that's probably true for many. But for me, I count it as a blessing that I live in the Northwest, where you don't have to drive all the time, giving me a chance to catch up on reading (I've never read so much as I do now) and avoid traffic and the "pain at the pump" to quote CNN everytime gas goes up. Where was I? Oh, right! I travel to Seattle about every other weekend to take a break from Intel. Over the next six months, that translates to roughly 4800 miles of driving, which would cost me about $800 at current gas prices. Yikes! Not too mention the clog on I-5 north of Portland every Friday as well as the drawn out commute up the freeway. It's just not the most exciting trip. When I moved down here, I started snooping around and found Amtrak. "Amtrak, are you kidding me?" I thought. Keep in mind, before moving to Seattle, I lived in California, land of the ever-late and ever-cancelled Amtrak routes. Granted, I never took one, but the stories I heard were enough. Hour delays waiting for freight trains (Amtrak leases their tracks) and cramped cars. Not to mention, it typically took you twice as long by train to get anywhere when you could drive (hint: fix up the trains and maybe not so many people would drive in CA). Thus, my skeptisicism. However, it IS only $60 each roundtrip (about a tank of gas) and I get a student or AAA discount, so for $100 less why the hell not? 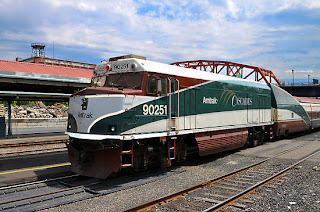 Now, many of my friends at UW who take this route said the Cascades was nothing like the "Star-late" (Pacific Starliner) or any other Amtrak routes. It is more like a European train, which I could relate to; I loved riding the rails all over Europe. I'll try anything once, so I said "Why not?" Since moving down, I've taken the train a handful of times and I must say, I'm pretty impressed. The trains are pretty much on time (+/- 15 minutes) and the cabin is very comfortable, complete with WiFi and a dining car. Besides the fact that I can get to the station from work with mass transit, I'd say by far the best thing is the view; the lakes and mountains look simply awesome, and you can't say the same for I-5. Now, there are some negatives (which I go over below) but needless to say that although I'm impressed, the fact that fares are actually about $90.10 RT after my discounts is a little more than I can swallow. What's a guy to do? 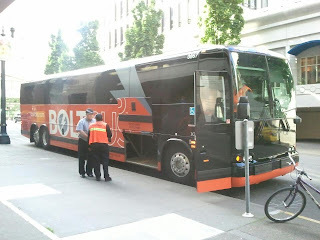 Well, one day at work, someone posted on our company blog about this thing called Bolt Bus, promising $1 (yes, $1) trips back and forth from PDX <-> SEA. Are you kidding me? This I had to see, so I jumped on their site (which was barely up) and grabbed a couple of RT tickets for $2! Pretty sweet. So what's their deal? They're actually part of Greyhound (but they never say that, probably for good reason) and have a few other of these routes in the Northeast. Not all seats are $1 (more like $10-15 each way when I look later on the schedule), but still, $20-30 RT!? AND it sounds like some people are randomly selected each trip to pay $1, which I think is a gamble I'm willing to take. I just got back from my first Bolt Bus RT Sunday and I must say, I am quite happy with the trip. Yes, it's on I-5 and no there's no food, but it is direct to Seattle (Amtrak makes about a half dozen stops) and it's more convenient to me (picking you up right off Salmon St) which is nice. The seats are cozy, though balancing your laptop on your lap is a little awkward. Oh, and the bus was only half full! Wtf? I'm sure that after people go and tell their friends (case and point: this blog) that they will become very packed. The drivers were very nice, but other than a few messages at the start and end, it was pretty quiet, which is nice. It sounds like they're adding more buses as they play around with the schedule, as well as adding routes to Eugene and Vancouver, BC soon, which is great. Man, they are RIGHT in competition with Amtrak: same routes, same times, cheaper cost. I know the view on Amtrak is great, but I don't know, this is gonna hurt. And they just got a bunch of federal money to improve the rail corridor, so I wonder how that will go. Maybe they'll finish the 5 years of renovations at King St? One last thing, the bus is so convenient downtown; it's right smack dab in the middle of Portland and Seattle, whereas Union Station is a bit out of my way for the train. I got home on Sunday, walked one block east, and 2 minutes later I was on the 15 to Belmont. Beautiful, my hat's off to the guys at Bolt Bus for making this really a great experience. There you have it, the train vs. the bus. I hope this helps you decide on your next trip. As for me, I will deifnitely be taking the bus more often than the train, though I think the extra room for my computer and the view will call me back every few times. As one article put it, the train is more about the experience in many ways; if you just need to get from A to B, then Bolt is definitely the way to go. Otherwise, it may be worth taking the train. That's my two cents, now go forth and enjoy your ride around the PacNW! After my first week at Intel, I'm starting to find my groove. One tough spot has been my commute from the SE everyday. I know, why did I live that far? 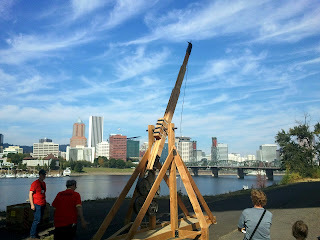 Since I'm here for 6 months from Seattle, I thought I'd take the opportunity to live in Portland and try it out. That said, the first week of driving was pretty bad; nearly an hour one-way in rush hour traffic. It only took a few days for me to realize that I needed to change my route. And that's where the idea of biking arose. I've done this many times before (as illustrated below), but this was the longest commute by far (20 miles). I'm here to share my story of commuting by bike, provide tips, and possibly encourage you to also give biking a shot, even when it seems out of reach. Like any high school student in Michigan, I wanted nothing more than to have my license so I could drive. And that I did. At the same time, I loved (and still love) to bike. My dad and I used to ride all over town as well as participate in touring rides such as the Five Boro Bike Tour (NYC), the L.A.T.E. Ride (Chicago), Apple Cider Century, Blue Water Ramble, Hell Ride, Peach of a Ride and Big Mac Tour. When I moved to California to start college at Cal Poly, I got a car my second year and started driving the 5 miles to campus each day, fighting for parking and paying hundreds of dollars for a pass just so that my car could get dinged (which happened the first week). I soon learned I was big road trip fan and gladly volunteered for excursions up the PCH to Monterey, down to Santa Barbara or just the In-n-Out in Atascadero. 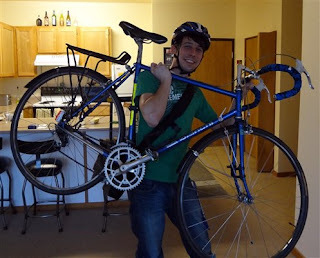 I was also biking quite regularly for exercise, but I never thought of driving to campus, even when my car was in the shop. Bike? ALL the way to campus? That sounded crazy. Then one day it hit me: why can't I bike to school? I mean, I used to bike 50-75 mile rides all the time back home, so what's five measly miles? The worry wort in me came up with a million excuses: what if I get a flat? what if I'm late to class? what if it rains? To quell those fears, I experimented, testing bike routes when I had time, figuring out how to pack clothes, tools and books into my backpack and dealing with flats as they arose. Turns out, it was pretty simple, so I began riding every other day. Soon, I switched to a Timbuk2 bag because the backpack wasn't cutting it and I started picking up more gear to keep me warm. Sure, some people looked at me weird when I washed up at the UU (the union), but I was proud to wear my rolled up jeans and a messenger bag strapped diagonally across my back. Not only did it cut down on gas and reduce my carbon footprint, it was also more relaxing and energized me everyday, not to mention giving me a chance to get some exercise in. Graduation day came, and I found myself working for HGST in the sprawling mass that is San Jose. I slogged the 15 miles along Highway 85 every morning from Campbell to South San Jose, enduring the traffic and Bay Area driving skills (no blinkers, merging across all lanes, etc...). I chatted about biking with my coworkers, but bike 30 miles a day across a not-so-bike-friendly city? Oh, now you got to be kidding! However, after surveying the shower situation at work, calculating my routes and planning my gear list, it didn't seem too crazy after all. People at work (and still those I tell about this today) think I was probably a little mental, but I'd say we're all a little bit crazy in our own way. Skeptics aside, I began biking roundtrip 30 miles every other day. I picked up a lot more repair skills (broken tires, flats, lost pedals...) as well as clothing (rain and cold weather gear) and fitness know-how. I strained this and that, and even gave myself carpal tunnel from improperly adjusted handlebars. No matter, I still pulled it off, biking roughly 6000 miles during my two years at HGST. Next up, grad school at UW and biking through the lovely Seattle weather. Again, more rain gear (and even some snow gear) along with more knowledge of riding in not-so-ideal conditions. I'll be honest though, on my 5 mile trip from Ballard along the Burke Gilman trail, nothing is more fun than riding in the pouring rain, if properly geared up of course. Now, I've taken a 6 month hiatus to work as an intern at Intel and I'm so happy I have the chance. As I mentioned before, I'm taking advantage of my time here and have decided to move to the SE, keeping in mind how bad my commute to JF was going to be. After just my first week on the job, I was over the commute. Upwards of an hour hauling myself through stop-and-go traffic along the Sunset and I-405 was just not my idea of a pleasant weekday evening, so I started eyeing the MAX. I can happily say that despite this being my longest commute ever, I'm successfully managing to bike and train to the campus without adding a ton of time to my commute. Of course the first few days of the commute have been a little rough (this being day two), but I'm learning a lot each day. For example, I had no idea how to get my bike on the different trains, but now I understand. I also realize that carrying two bags (a pannier and my Timbuk2) is a little cumbersome and have consolidated them into one. Using a combination of bike > train > bike, I can get to work and be ready to go in a little over an hour; not too shabby. And in the interim, I can read, plan a trip, whatever I feel like. It's great! As you can see, over my 6 month stay, I will save $396, not to mention wear and tear on my car while also getting exercise and keeping the air cleaner. In that same time period, I will cover roughly 1440 miles by bike, or roughly the distance from Vancouver, BC to the Mexican border. Not too bad. Always have a backup: a bus, a train, or a car. For those days when you can't bike or you have an emergency. Check conditions before heading out. Rain and cold are fine if you have the gear. I bike when it's above freezing and the wind speed is below 20 mph. Check your tires and lights before leaving. Roll up your right pant leg (or use a reflective ankle band) to keep looser clothes out of your gears. Know your route; bring a map of the city if needed. Time your bus/train segments. Make sure you know the rules of bikes on the bus/train and have a schedule. Have a phone for emergencies. Leave some gear such as toiletries and a pair of dress shoes at the office. Bring your bike with you if you can. If you have to leave it at a station, be sure to properly lock it, with the U-lock through the front tire and frame and the cable between the two tires and attached to the U-lock. Be curtious and follow posted street signs. Use hand signals to indicate turns to car and bike traffic. Slow down and check intersections before barreling through them. Stretch! It might seem silly, but it can save a lot of pain down the road. When I first got here, however, it was a bit of a different story. It was always dark and cloudy. It was cooler than California by a ton. I started grad school and didn't know anybody. My housing situ wasn't the best. After a few weeks, I was beginning to think I made a serious mistake. But, as with San Jose, I just told myself these things take time. I mean, this is the second time I've uprooted myself, left all my friends and changed states; it's not easy. However, after living here a couple months, I ABSOLUTELY love it! And while many people (especially Californians) think I'm crazy, I can't really find much that I dislike. I think it's because Seattle reminds me a lot of the Midwest, just not with tons of snow and humidity. That's fine with me :-) I've come here a few times before this, and loved it each time. So what's new? The short version: I'm in grad school, I TA, I'm (still) writing my novel, I'm working on starting a company, I'm starting a new volunteer group like SVV (yay! ), I'm dating, and I'll be starting an internship for 6 months in March...MAN, a lot can happen even over a few short months! C89.5, dance music 24/7 and no commercials! Whew! I think that about does it, and it's not even a year in haha. It's a great place, and sadly Seattle often keeps me too busy to blog BUT I promise to write an update at some point.